I received the doll today. I am so excited! I do need to clean up her bonnet a bit as it is dirty (the seller did say that it needed some cleaning). I am looking for a special doll that my grandmother purchased for me the day I was born. The doll looks very similar to the 60’s pink bunting musical doll that you have posted. The doll was wearing a similar fuzzy pink bunting outfit. 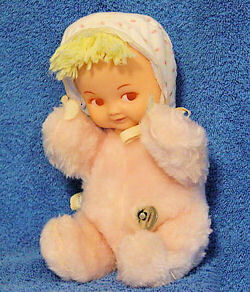 She has what looks like a cap/bonnet on her head that is white with a pink rosette pattern with white eyelet trim. Her hair is blond and looks like it is made of yarn. Only a tuft of it comes out from the front of the bonnet (supposed to be her bangs I think). Her body was soft cloth and her head/face was plastic or vinyl. She was a musical doll that wound up, and her head would move gently as music played. I do not know what music it played. I want to find her, or a similar doll, for my 8 month old daughter. I am assuming that she was an Eden doll, since they look so similar. If anyone has any info it would be great if you could point me in the right direction to finding her. 060709-4 what year were you born? I was born in 1980. Thank you for the eBay reference! I showed my mom the item and she confirmed that it is indeed the doll that I had!!! I have contacted the seller of the doll and put in an offer to purchase it. I cannot afford to pay the $60 asking price for it. Hopefully the seller will be able to accept the offer I put in. I am still in disbelief that the doll has been found! It would mean so much to me to be able to have it for my daughter. Thank you so much for the information. I'll let you know if I get it. I had this doll too! I recently found her when going through my mom’s attic stuff. I would love to know more about her. What is the song that she plays? What year was she produced? If you have any info, I’d really appreciate it. She was my first toy. I am pretty sure the song she plays is Thank Heaven for Little Girls. I don’t know what year she was produced. All I know is that my grandmother bought her in a toy store the day I was born and gave her to my mom. I was born in 1980 but it appears that similar versions of her were already around for years. Is anyone still looking for this doll? Just pay shipping & it’s yours.